Once a finance major at Appalachian State University, Joseph Miller didn’t learn his sushi-making skills in the classroom. He was so driven to create the Japanese staple in the mountains of WNC that he spent five years apprenticing in sushi restaurants in Steamboat Springs, Colorado (the “Co” in CoBo) and his hometown of Boone (the “Bo”). Miller’s sushi craving led to far more than just raw fish and sticky rice. His restaurant, CoBo Sushi Bistro and Bar, has become a lively late-night downtown hot spot, attracting families earlier in the evening and couples, young professionals, and students later on. CoBo’s unassuming entrance is tucked into a dark, quiet end of Howard Street. But stepping through the glass doors feels like entering the set of one of those stylized hipster beer commercials where the music thumps as the subject glides through extravagant party scenes with a backdrop of glitter, glam, and beautiful people. Perhaps it’s not quite so dramatic, but the numerous and attentive bartenders are dressed smartly in black vests, some in ties, some in jaunty hats, and the sushi chefs wear baseball caps. There’s often a waiting list by early evening. When I visited on a recent Friday night, the diners’ excitement was palpable, even though the restaurant has been open for two years. At the 17-foot bar, about 20 patrons sipped colorful cocktails or sake from tiny ceramic cups and guided bits and bites into their mouths with chopsticks while three sushi chefs rolled order after order. Arrive any time after 6 p.m., and you’ll likely linger in the seating area next to the entrance, as CoBo doesn’t take reservations. Here, Eastern elements marry mountain contemporary touches. Large gilded tree stumps serve as low cocktail tables surrounded by wingback chairs covered in golden tones of velvet. Further inside, wide booths allow for family gatherings along one side of the dining room, and toward the back, dramatic angular chandelier lighting creates a more intimate scene. These and other design flourishes—fiber optic lights sprinkled throughout the black- and gray-patterned concrete bar, gold glitter wallpaper, and black lacquer mirrors in the powder rooms—showcase the attention to detail by Miller’s high school classmate, designer Priscilla Hyatt. A variety of sake styles—hot, cold, and flavored—top the drink menu. Classic standards like Pimm’s Cup and Moscow Mule share billing with the CoBo Martini, made of gin, sake, and the venue’s house-made bitters. I chose the smoked pineapple margarita, which combines sweet, sour, and smoky notes (via a hefty pour of mescal). The sushi menu begins with the typical litany of house rolls: Philly with salmon and cream cheese, Kalifornia with avocado and crab, shrimp tempura, spicy tuna, unagi (eel), and so on. Patrons overwhelmingly order from the specialty roll menu, which includes the tempura-fried Appalachian Roll; the partially seared New Yorker with filet mignon, lobster, asparagus, and crispy shallots; Mile High with tuna and apples; and Crunch Time with tuna, crab mix, cream cheese, and sweet nitsume sauce. Conveniently, the menu notes which dishes contain any form of raw fish should patrons prefer a vegetarian or cooked-fish option. Our server recommended the Burning Man with barely seared tuna and spicy crab mix. The tempura crunchies added a rich nuttiness, and the sweet, lightly spiced CoBo sauce added another depth of richness that made me wish I had ordered several rolls. One of the chef’s specialties is creating particularly beautiful plated dishes. Miller, who often works the sushi line, torches paper-thin yellowtail sashimi and layers it with jalapeño, diced apples, and crispy shallots. The lobster-cucumber salad is a kaleidoscope of shades of red, green, and orange with whole claws placed delicately on finely julienned strips of cucumber and apple doused in sweet vinegar sauce. Hot entrées reach beyond the norm with dishes like the peppered filet, served over smoked Gouda and prawn grits, or honey duck seared with a ginger and soy-honey glaze over steamed rice and a topping of bacon. Taking a nod from pubs, the restaurant also offers ginger beer-battered cod with sweet potato fries and CoBo sauce. Another accessible dish, hibachi-grilled shrimp on brown rice, packs decent flavor and comes beautifully accompanied by intricately cut vegetable garnishes. If anyone wants a sweet after such a regal meal, the kitchen makes them in-house, including a tempura chocolate chip cookie, served with pickled ginger ice cream and wasabi cream, and several unique cheesecakes. 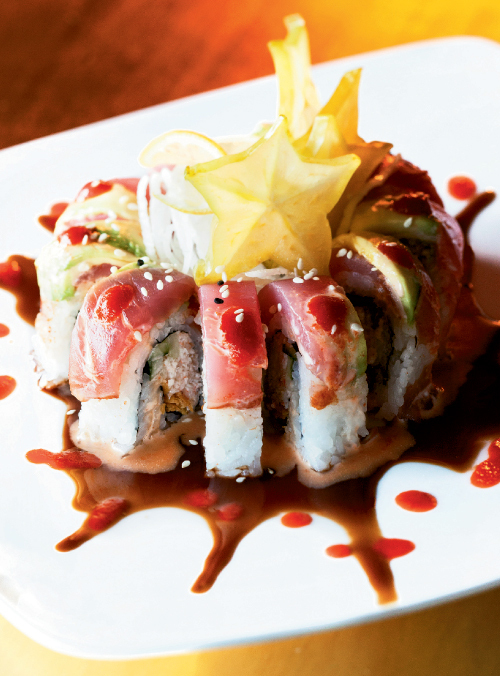 To the last bite, CoBo brings a truly sophisticated dining experience to Boone based on the theme of a sushi bar but moving far beyond. Don’t Miss: The smoked pineapple margarita. The sweet, sour, smoky low-slow burn of this cocktail marries well with a variety of dishes.